David Dyson has been on the scene for a while now, and with his latest release “Unleashed”, he is truly defining the Dyson sound (and voice). His signature groove playing as well as his impressive improvisational chops has kept him incredibly busy in the industry, and justly so, and with this third solo CD his status of “solo artist” definitely takes on a whole new perspective. David has always been a formidable sideman for many well-known artists, but I think his time has come to step out into the limelight. Well crafted tunes, extremely slick and soulful groove lines, and a beautiful solo voice on his new signature instrument is going to make his name a little bit more of a household word in the bass community. And it’s my pleasure to add to that the fact that he is one of the most genuine people I’ve met in the business… a gentleman in every respect, and a diehard music enthusiast. Good person, dedicated musician, no ego, killer player… pretty hard to beat that. 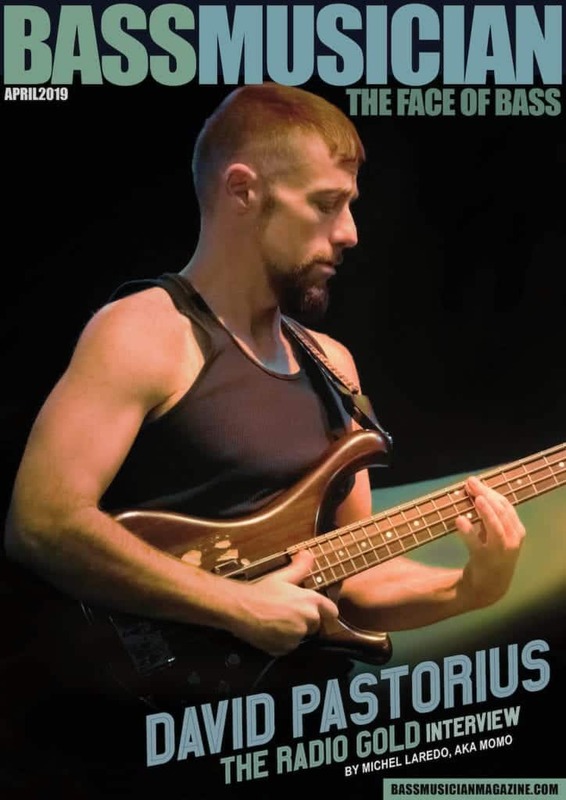 Jake: With the recent release of SMV with Stanley, Marcus, and Victor, I think people’s awareness and appreciation for the solo bass artist might be at an all time high. What do you think originally motivated you to follow that same road? David: First of all, the pure love of music, as well as the love for the instrument. I was totally drawn to the bass. And then there were the cats that influenced me and drew me to the bass, guys like Louis Johnson, Larry Graham, and Bootsy. Beyond that, I can honestly say I don’t know if I would feel the same way about putting out my records if I didn’t feel the way I do about composing as well. I really love to write. To be honest, I think I enjoy writing more than I do playing. There are a lot of artists out there that want music for their project, something to blow over so they can put something out. I don’t put out CDs just to be putting them out or selling them…don’t get me wrong, it’s good to make some money, but that’s not my motivation. I truly feel I have something I want to share, something that just comes out of me, out of my heart, and I enjoy being able to share that with everyone else. It’s my compositions that I want to share. To me it doesn’t make sense to have someone else write something for me. My whole purpose for doing a CD is to be able to share “my” music with everyone. Jake: Tell me about your compositional process. Do you do most of your composing at the keyboard? David: I’m by no means any kind of adept keyboard player. I know a good amount of theory, which certainly helps, but I don’t really have any kind of piano chops. The composition develops based on where I start writing the tune. If I start on piano, it will have a certain vibe, and if I start on the bass it tends to have a different vibe. The same would hold true if I start on guitar. Sometimes I literally just have a tune in my head while I’m driving down the road… it can show up anywhere. So as you can see the vibe of the tune just depends on where I start from. I always say, “I play to write,” on piano, guitar, whatever. On my newest CD, I actually layed down quite a few guitar parts for a demo to give the players, and after listening to the tracks, and a few opinions from friends, I actually decided to keep some of it. Jake: I know you got your bachelor’s degree in production and engineering at Berklee. It seems these days even the best artists still have to wear a lot of hats to keep forward momentum. Are working on these other aspects of being a musician, beyond you’re playing, something you would recommend? David: Most definitely! When I was musical director for the New Kids on the Block, I realized there were so many other things that I should be working on. Being more business minded was one of them, which I’m still working on, as well as networking and other aspects of the business I knew I needed to know about. My attention was put to the music and my job as musical director, which was important, but I should have been more aware of the other parts of the business. I can see now that you definitely have more worth when you know a lot more of the business side, as well as being a writer, composer, producer, and arranger. Everyone has their strengths, and it’s good to know what those are. I know in the studio I can handle the recording end, but I’m much stronger working on the mix for the tune. And then there’s the whole talent of being a producer. One of the things you have to know when working on a tune is simply who to call. I learned a lot about that at Berklee when I was putting bands together for my recital. Sometimes I just chose the wrong cats for the tune, even though I liked them as players. There’s a whole art involved in just that alone. All these aspects make you more valuable as a commodity in the business, and that’s important. It’s great to have as many things under your belt as possible…. it’s a hard business. Jake: No argument there. Let’s focus on your playing. I think one of your fortes is slipping from a groove into a solo, and within that improve I can definitely still “feel” that groove happening. Is that at all a conscious effort on your part, or just the voice you’ve developed over time? David: I believe that’s something that has just developed over time. It’s not really a conscious effort on my part, but it is very important to me. I always like to feel the groove, and it doesn’t matter what type of music it is…. classical, fusion, rock, gospel, bluegrass, whatever. Every style of music has a groove, and I always try to accentuate that groove, even if I’m soloing. That’s always first and foremost in my mind. Jake: I really believe there’s an art to accomplishing that. It’s one thing to want to do it, and another to be able to do it. I asked a similar question to Gary Willis, that being, within creating a groove line or solo, is there anything at all that you’re thinking about, and basically he said, not really. David: I got a chance to play with Gary at Gerald Veaslys boot camp. I love his playing. We played together and I felt we had some really nice things going on. It was really cool to see him react to what I was doing, and I felt good about that. I was honored. A lot of people don’t realize it’s an art to be able to play with another bass player. You have to know how to lay it down for somebody and stay out of their space. I would really like to do something with him in the future. Jake: This actually kind of leads to my next question. You’ve worked with Michel Ndegeocello in the past. A renowned bassist hiring another bassist to back them is quite a compliment. How did that particular gig differ from others? David: It was one of my favorite all time gigs. She’s a great groove artist as well, and she allowed us to open up on that gig. She put a lid on things every once in awhile, but basically it was very open, and the band was killer. We all had a lot of fun on that gig. When she wanted me to step out and solo myself, I actually just wanted to lay back and groove behind her. 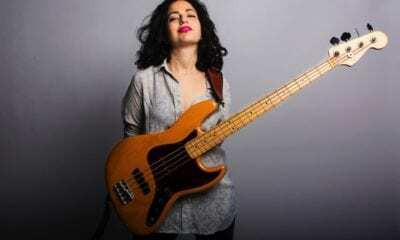 She’s one of a select few that really understand about playing with another bass player. She definitely knows about space. I have more fun staying back with the groove than soloing myself. It was great just working with the two of us and the drummer and creating a killer groove. Occasionally I’ll listen back to some of those tapes, and I really enjoy them. It was an honor to be picked for that situation. Jake: Here comes one of my recurring questions. Looking at your discography tells me you’ve earned a great deal of respect as far as your quote/unquote groove playing is concerned. I know it’s a hard question, but what do you feel you bring to the table as far as your concept of groove that makes you just a bit unique? David: That is a hard question. First off, I understand and appreciate that everybody is unique. As far as myself is concerned, I realize that everybody feels ‘the one’ differently. Sometimes I’ll start a groove, and the drummer will feel where I’m hearing it, and other times that’s not the case. I realize sometimes I feel things differently, and that probably is the culmination of what I’ve listened to over the years. But I always try to give the artist what they’re looking for. I’m always more or less asking myself, “Why have you hired me for this gig?” and then beyond a solid bottom, which I’ll always give them, I’d try to figure out what else I can bring to them. Unless they ask me for more, I’m always going to tend to hold back and not throw a lot of licks in. But if they give me more room, I’ll take it. I always try to give them just what they need, and at the same time try to keep my musical personality involved so they know its David Dyson playing. Jake: In my “Notes from the Editor” section for this issue, I talked on the infamous subject of what to focus on in your studies. If you were one on one with let’s say an exceptional student, what direction might you take them from your experience? David: The first thing I would do is assess where their strengths and weaknesses are, or at least what I perceive to be their strengths and weaknesses. I’ll use the example of a student I’m very proud of that’s out there quite a bit right now, Steve Jenkins. When he first came to me I saw a lot of potential. He picks up everything very quickly. I also saw a lot of myself in him, that being in my fusion years. I wanted to play as fast as I could and play a lot of licks and wow everybody, and that’s where he was at. But solo wise, he was still developing, melodically and rhythmically. When he began with me, he actually wasn’t “saying” that much. But man, he sure developed quickly. And it wasn’t just because of me; he was studying with a lot of teachers, as well as some time spent at Berklee. He’s become a phenomenal player. And I knew eventually he was going to come back and sit with the groove, which he has. I think that’s just a matter of musical maturity. I felt proud when I saw him let the chops go and more or less return to the groove. So as far as advice goes, I think what’s important is to check out all the cats that you like, and try to understand what you like about their playing. And for a while, you’ll sound like whom you’ve been influenced by. But that will change over time and you’ll start to discover your own voice. Your voice “is” in there, you just have to find it. Then you can take the techniques you developed and apply them to that voice. Jake: Final question here. Tell me about your new CD “Unleashed”. David: This is the third CD that I’ve done, but it’s the first one that’s taken as long as it has to put together. I think that’s because I have a lot of other players involved, and my schedule has been busier than it ever has been. It was originally going to be called New Horizons, and as I continued writing for it, the concept kind of changed and I called it “Unleashed.” I’m pretty proud of it at this point, and hope that people dig it. Rick Braun is playing on it, as well as Russell Gunn, Alan White, and a lot of other great players I’m happy to have onboard. Jake: This CD is different than your first two CD’s, as far as having a lot of different players involved. David: Exactly. I enjoy writing for and playing with a lot of musicians on a project. Admittedly, I couldn’t do that for my first two CDs for monetary reasons, as well as wanting to get things done in a particular time frame, which is much harder when you have a lot more people involved. I hope I can keep moving in the direction of being able to have more musicians on board for my recordings, and I’m looking forward to putting a band together for this project and playing out as much as possible, something I’ve been wanting to do for a long time.